Soweto, where Wanjiku lives with her five children, in a single room shack, is an informal village at the southern tip of Kibera. Here, rivers of raw sewage snake through the landscape of dilapidated mud-walled tin houses. Only one in five has electricity. The cost of water, a scarce commodity, is ten times its market price. As many as 4,000 people share a rickety toilet. Security is provided by vigilantes. That is because this informal village is officially an illegal settlement. Which means that neither the government nor the so-called slum-lords (the shadowy figures who own the shacks) are obliged to provide any services, such as water and sewage, to those who live here. It has happened so many times: once-upgraded Moroto turned into a commercial site; Pumwani became rich and its original slumlords simply took hold of another muddy place. Ayany, parts of Woodley, Kibera Highrise, Langata. All these places, earmarked to benefit Kibera dwellers who generally live on less than US$ 1 a day, are places for the middle class now. The poor have been continuously removed, relocated, cut off from whatever social networks and means and ways that they had themselves built to survive, invariably to end up in the mud again elsewhere. Road to Kibera. Photo: Courtney McDonald/Flickr. She is not wrong. 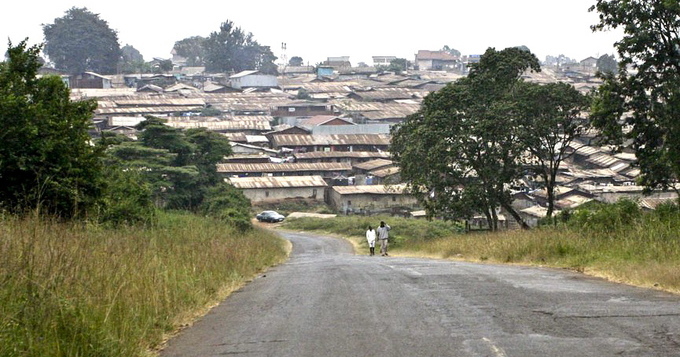 The current US$13 billion Kenya Slums Upgrading Project (KENSUP) funded by the UN Habitat and the World Bank, like the previous upgrading projects, is already once again displacing area residents in favour of the wealthy. KENSUP’s aim, according to a UN Habitat strategy document, is “to improve the livelihoods of people in Kenya’s slums through provision of security of tenure, housing improvement, income generation and physical and social infrastructure”. The 15-year KENSUP scheme was expected to improve the livelihood of 5.3 million urban slum dwellers by 2020. It involved the construction of 45,000 house units annually. The first phase is again targeting Soweto, where Lucianna Wanjiku lives: one of Kibera’s 17 villages. It is there that KENSUP is supposed to deliver 770 housing units at Sh 650 million (US$ 6,6 million), together with physical and commercial infrastructure and sanitation, among other things. The project is part of the UN’s Slum Upgrading Programme that, and in line with the Millennium Development Goals (MDGs) is meant to uplift conditions of life in poor countries. “Slum upgrade” is Millennium Goal 7, Target 11, “which aims to significantly improve the lives of at least 100 million slum dwellers by the year 2020,” said Ann Tibaijuka, the UN Habitat boss at the time of the launch of KENSUP in 2005. Tibaijuka said she believed that the success of Kibera project could have far-reaching implications with regard to the replication of the scheme elsewhere in Africa. But, again, it is not happening that way. “They were meant to be our houses but they were taken over by outsiders,” Soweto resident Richard Wafula says, pointing to a vista of 624 high-rise apartments on the fringes of the township, developed under KENSUP in 2007. The neighbourhood playgrounds are all full of cars belonging to those who live there now. ““We applied but never got any because they very expensive. The rich grabbed them.” The settlement is also called Soweto, but it is, once again, a newer, better, Soweto. Nearly all the tenants and owners of the new apartments are from outside Kibera. They are middle-class bureaucrats, politicians, businesspeople and representatives of NGOs. KENSUP also didn’t deliver anywhere near the planned 45 000 ‘units annually.’ By 2015, only the afore mentioned 624 apartments were completed in Soweto East Zone A, 17 years since the government and UN Habitat signed their MoU in 2003. Officially, KENSUP officials have given explanations for the delays. But unofficially, sources say the KENSUP target has been moved from 2010 to 2025. Few feel that it will perform better in the next eight years. Firstly, the slum population keeps growing. Secondly, houses are useless to the poor without land tenure, security and infrastructure. Resident Michael Arunga, who represented Kibera civil society in the KENSUP planning committee, feels that the project was doomed from the start. “How can people without any income even afford decent housing? People have no livelihood.” He believes the scheme was started for “political reasons” and not genuine in assisting Kibera people to build better lives. Some former Kibera residents who did move in the new houses now sub-let them in order to make a living, he says, and still stay in shacks. Researcher Peter Mwaura Karani, who carried out a small survey about KENSUP among Kibera residents in the context of slum upgrading research he did for the German University of Magdeburg (1), found that 27 out of 33 respondents believed the upgrading programme would fail. They feared displacement, affordability of high rent, forced relocation which could affect meagre livelihoods, and a destructive effect on social life. 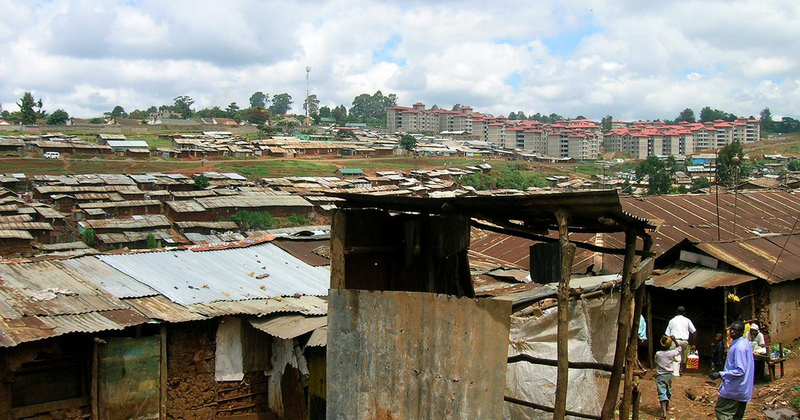 “The slum problems are too diverse to be tackled by simplistic approaches,” Mwaura Karani says. 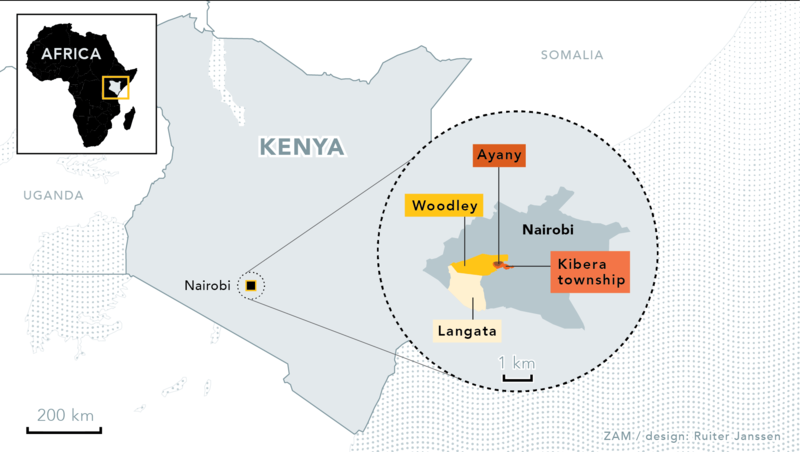 “The way it is now, it is just complex, confusing and a time-bomb.” This is mainly, he and other observers say, because Kibera residents themselves were not asked for their views -or, in the case of Michael Arunga, were not listened to. “We have been telling the Department of Housing that they should involve people. If they don’t, it’s going to be chaos,” Jack Makau, an official of the NGO Slum Dwellers International, says. Meanwhile, neither the government nor UN Habitat talk about the elephant in the room: the slum lords, these powerful “shadowy” individuals who own the makeshift houses but who stay in affluent estates elsewhere. They do not want to let go of their properties. Raking in the rent, they will also benefit when it is time to be paid compensation in case of relocation or demolition, since they are the actual owners of the houses. After which they would buy up more places to rent out, all the while never bearing any responsibility for the sewage-flooded area itself. Recent research by the World Bank as reported in the Kenyan press (2) has suggested a solution could lie in bailing out the slumlords once and for all. The World Bank report calculates that US$ 1 billion would suffice to make landlords go away and give residents real tenure, after which real upgrading could take place. But that is not happening. Instead, government plans to pump another US$ 5 billion into KENSUP. The ‘upgrading’ plans continue, though. A formal spokesman for the housing ministry said that tenure and infrastructure services were now on the agenda and that 498 informal settlements had already been “mapped out” for that purpose. He also called KENSUP a “huge success.” But a top official in the same ministry, requesting anonymity, had another view.